Following yesterday’s excitment, things are returning slowly to normal here at Wizard’s Tower. 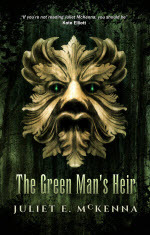 The Green Man’s Heir is no longer on sales at 99p, and is no longer receiving special promotion from Amazon. However, the effects of that promotion linger on. 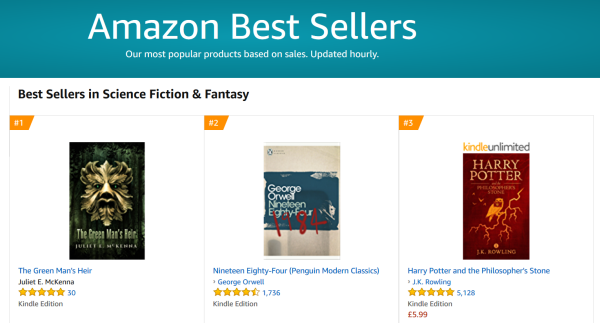 As I type this, the book is still ranked #6 in all fiction sales on Amazon UK, and is still #1 in science fiction and fantasy. That is still leading to a pleasing level of sales, though obviously nowhere near yesterday’s flood. As a publisher, what interests me is the long-term effect of all this. How long will the sales rank stay high enough to keep the book easily visible on the Amazon website? How many of yesterday’s thousands of purchases will result in reviews, or returns? What will the effect be on the sale of Juliet’s other books? Only time will tell, but I will be keeping an eye on the data. 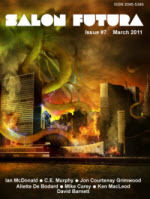 Other small press owners may well be interested. In the meantime I’m just going to keep staring at that screenshot at the top of this post. There are no Hugos for Best Publisher, but I’ll happily take that instead. 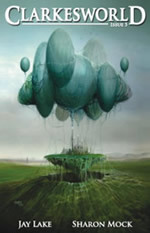 This entry was posted in Books, Publishing, Wizard's Tower. Bookmark the permalink.